Why did the turtle cross the road? Yes, in fact, it did want to get the other side. And so do a host of mammals, amphibians, fish, birds and reptiles. Our necessary network of roads has diced up habitats, disconnecting nest and forage sites from water and bisecting migration paths. The Oregon Conservation Strategy identifies “Barriers to Fish and Wildlife Passage” as one of the key conservation issues in the state, and many people and organizations are working to provide room for the natural movement of animals across the landscape. If you think navigating Portland metropolitan streets is getting harder, consider the challenges facing a deer, an owl or a salamander. While roads and railroads are necessary for people and commerce, they can create dangerous barriers for wildlife. How those wildlife get around—and they need to as they move between habitats seeking food, prey, mates, nesting habitat and following age-old migration paths—is of concern to regional planners and those who value wildlife. Frogs, newts, turtles and owls are increasingly becoming road kill, and deer and elk vehicle collisions kill large numbers of animals and threaten human safety. Hennings believes providing safe passage for wildlife is possible despite the fact that within 25 years the area is expected to grow by a million people. 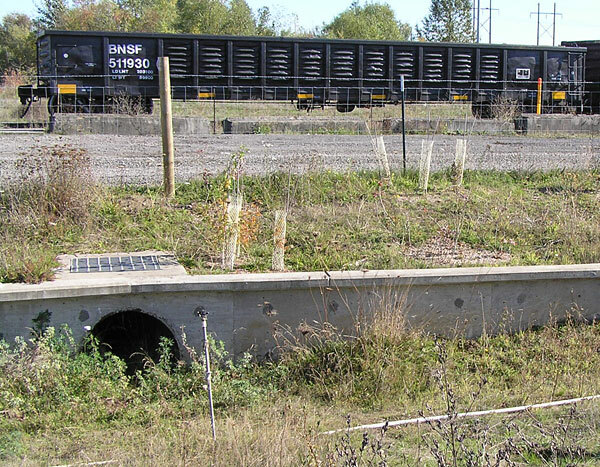 The Port of Portland created a culvert underpass to help Oregon’s native turtles stay out of the road. ODFW photo. Metro staff have already done a lot of work on wildlife crossings. 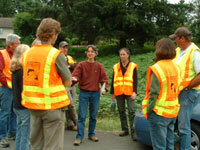 In 2009, they published Wildlife Crossings: Providing Safe Passage for Wildlife. 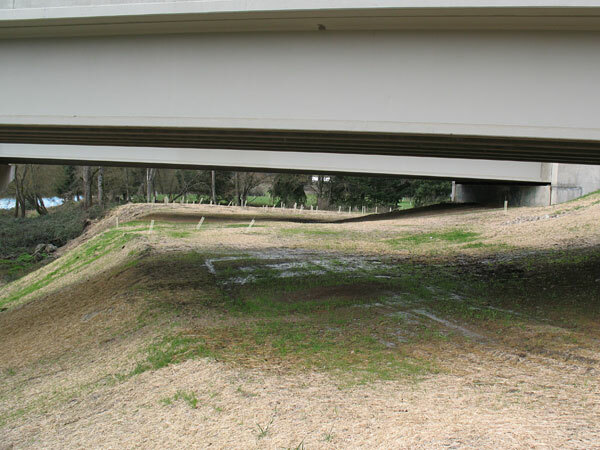 Designed for transportation and city planners, the book provides recommendations on how to build or enhance wildlife crossings such as underpasses, walkways through culverts and overpasses. Information on fencing, lighting and plantings for specific wildlife species is also included. Hennings and others at Metro are currently completing a literature review of about 400 studies concerning urban wildlife connectivity to glean information for mapping key wildlife habitat and connecting corridors. Metro is Portland’s elected regional government serving more than 1.5 million residents in Clackamas, Multnomah and Washington counties and the 25 cities in the Portland region. 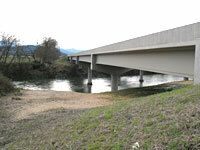 Missouri Bottoms Bridge, in Myrtle Creek south of Roseburg, allows animals to naturally follow riparian areas under the highway. ODFW photo. Thanks to the new Missouri Bottoms Bridge in Douglas County, blacktail deer, bobcats, raccoons, amphibians and turtles can now safely traverse Myrtle Creek without crossing heavily traveled I-5. Bridge construction was completed in the fall of 2009, and already deer have established heavily-used trails under the bridge. 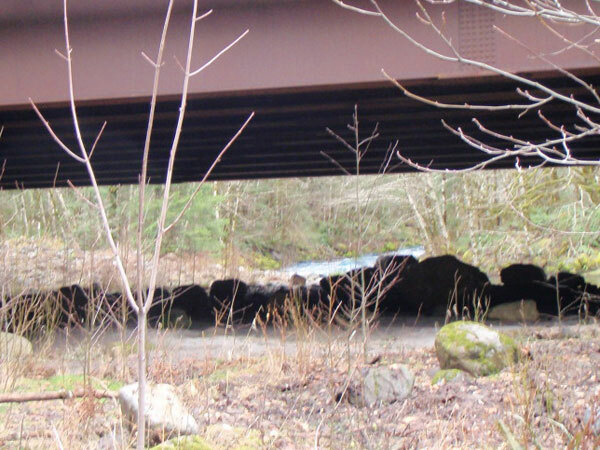 These crossing improvements are the result of a collaboration between the Oregon Department of Transportation and ODFW and falls under an agreement between state agencies to incorporate improved fish and wildlife standards when replacing bridges. 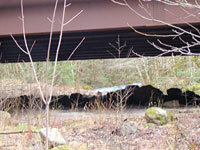 Missouri Bottoms Bridge leaves room for deer, bobcats, amphibians and turtles to safely bypass I-5. ODFW photo. Construction is also managed to higher standards as water pollution is contained and equipment and slurry managed. During construction of the Missouri Bottoms Bridge, fish were captured and released at nearby sites to avoid loss during certain phases of the project. The ODOT programmatic permitting agreement includes ODFW, Department of State Lands, U.S. Army Corps of Engineers and the National Marine Fisheries Services and provides for environmental performance standards that enhance fish and wildlife habitat during bridge construction. The agreement was signed in 2004 and incorporates monitoring of a number of the bridges over the long-term to evaluate how the wildlife strategies are working. For a copy of the Bridge Program Performance Standards for ODOT Bridge Repair and Replacement Regional General Permit (pdf) document, visit ODOT’s website. There are a number of tools available for those who want to provide fish and wildlife movement across roads including signs; animal detection systems; road and bridge design; fencing; fish screens; culverts; under and over passes; and public education. What tools are used depends on a number of things including the severity of the problem, needs of the species involved, policy guidelines, public support and budgets. Here are a few examples of how problems are being addressed around the state. The Oregon wildlife movement work group met in Lincoln City to tour an area where a resident elk herd regularly crosses Hwy. 101 to forage. Fencing and road design: Boeckman Road in Wilsonville showcases a number of wildlife crossing strategies. During design of the new road, which transects a wetland, the City and ODOT planners incorporated culverts, exclusion fencing and an amphibian wall to allow wildlife safe passage. The fencing and the wall keep wildlife from entering the highway and funnel them to culverts and an underpass so they can safely cross. For more information. Public Outreach: A citizen advisory group is meeting to help with public outreach and education concerning the resident elk herd that regularly crosses Hwy. 101 near Lincoln City. The highway is curvy and its many access points make it difficult to manage wildlife crossings, but a group of interested people are committed to finding a solution. Bridge design: A wildlife pathway or “bench” was incorporated into a bridge replacement on the Zigzag River, a tributary of the Sandy, to allow for mammal passage. 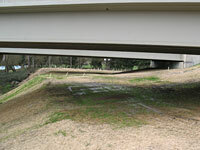 The bench is a flat, vegetated area under the bridge, just above the high water line, that facilitates animal movement. A recent site visit showed many animal tracks. A bridge over the Zigzag River incorporates a wildlife bench that gets heavy use by a variety of animals. Road underpass: Two wildlife underpasses and fencing have been incorporated into an expansion of Highway 97 south of Bend—one is exclusively for wildlife, the other shares a road designed for vehicle traffic. About a hundred mule deer die on a four-mile section of the road every year, usually during annual migrations when the animals move to and from the west slope of the Cascade Mountains to habitat east of Highway 97. More information. 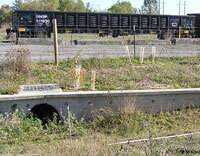 Fish screens and culverts: Road culverts can inhibit passage of native fish. Fish screens which prevent fish from being drawn into a water diversion mechanism can reduce fish mortality and good culvert design assists fish passage. A culvert replacement on Coal Creek improved spawning and rearing habitat for salmonids by increasing culvert size and placing boulders within it to create eddies and pools. Partners are Benton County Public Works, OWEB and ODFW. More information on the ODFW Fish Passage Program. Visit ODFW Wildlife Connectivity on the website to learn more. With the decline of much of their natural habitat, bats are increasingly turning to bridges to roost. As a result, ODFW and ODOT work to include bat habitat into new bridges and protect existing habitat during bridge repairs. Bridge repair is another subject, however. The John Day River Bridge on Highway 19, which will undergo repairs in 2012, is home to a large maternal colony of Townsend’s big-eared bats from late spring through early fall. The colony’s roost site is in the bridge’s hollow box beams which will be closed during renovation. Alternate roosting habitat is being prepared now before the bats return in April or May. Townsend’s big-eared bats are listed as a sensitive species in the state. For information about Oregon’s bats, see Conservation Summaries for Strategy Species in Section B of the Strategy. Watch for turtles on land from late winter through the summer as they move between winter habitats or look for nest sites. ODFW photo. In late winter and early spring, turtles wake from hibernation and start to move around on the landscape, looking for food and mates. Despite their sedentary reputation, some turtles travel more than a half mile between habitats. In May and June, females begin searching for suitable nesting grounds to lay their eggs. “If you see a turtle on the ground, the best thing to do is leave it alone and let it continue on its path,” said Barnes. She also warns motorists driving along streams and rivers to watch for turtles crossing roadways; sometimes the only way a turtle can reach water or suitable habitat, is to cross a road. 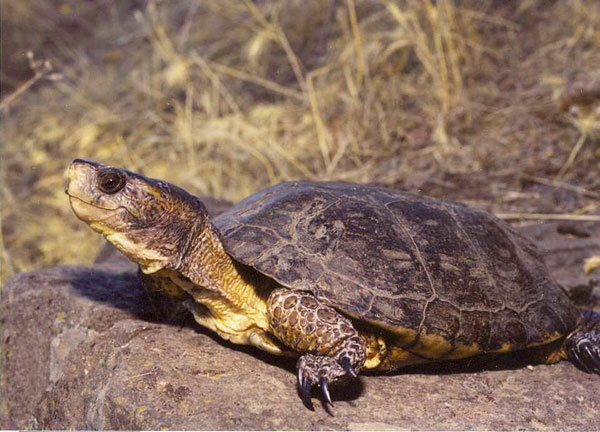 The western pond turtle, one of Oregon’s two native turtle species, lives in western Oregon. Females may travel as far as a half mile from water, although most nest within 100 yards of a water source. The painted turtle ranges from the Columbia River Gorge eastward and nests in sandy or grassy areas near water. If you see native turtles in the Willamette Valley, biologists are interested in knowing where they are and have created a website for reporting, willametteturtles.com. It only takes a few minutes and is a good way for citizens to help conserve our dwindling native turtles. 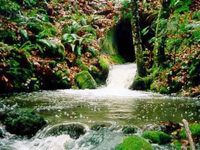 Fish passage allows fish access to spawning, nursery and rearing habitat. ODFW photo. Consider wildlife when you drive. Many large mammal collisions occur at dusk and dawn when light levels are low and animals are active. 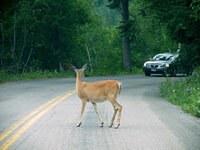 Be alert when you see a wildlife crossing sign and slow down. Learn about Oregon’s native species and what time of year they are likely to be moving on the landscape. The Oregon Conservation Strategy provides a blueprint and action plan for the long-term conservation of Oregon’s native fish and wildlife and their habitats through a non-regulatory, statewide approach to conservation. It was developed by ODFW with the help of a diverse coalition of Oregonians including scientists, conservation groups, landowners, extension services, anglers, hunters, and representatives from agriculture, forestry and rangelands. To subscribe or unsubscribe, please e-mail the editor. Note: The use of trade, firm, or corporation names and links in this publication is for the information of the reader. Such use does not constitute an official endorsement or approval by the Oregon Department of Fish and Wildlife.